Sue Knits: Finally! Some knitting! It has taken some time to find the right time and light and location to take some pictures of recent finished objects. One is the Icarus shawl from the summer 2006 Interweave Knits. The yarn is 2/18 New Zealand wool in a color called Santorini, knit on US4 needles. I finished the points with small clear beads to add a little sparkle and to keep the points pointed. 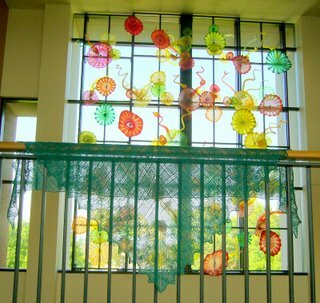 This picture doesn't really show off the shawl but I like the way it looks in front the the Dale Chihuly glass at the University of Puget Sound. 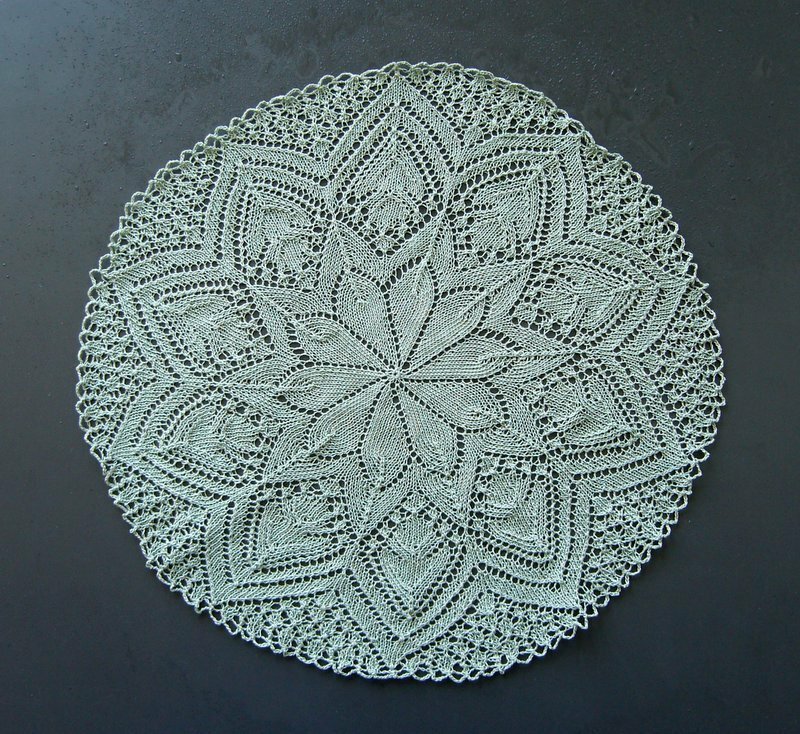 This is the Kaleidoscope doily from the Coats Patons (Canada) publication "Dazzling Doilies." Kaleidoscope also appears in Coasts & Clark's Book No. 111, "Priscilla Doilies to Crochet, Knit and Tat," published in 1959 by Coats & Clark, New York. Knit on US0 needle with Cebelia size 30, sage green, 12+ inches across. One of the pleasures of Labor Day weekend is tomatoes from the garden. 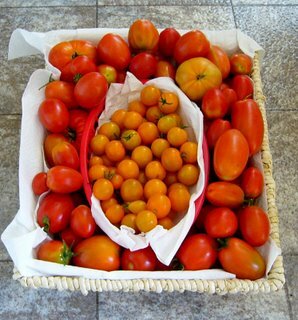 The little gold Sunspot tomatoes are the best for eating just like candy. I'm amazed, the icarus is beautifuland such a lovely colour. Iam knitting one too, but there so many other things that are tempting. I can't wait to see this one in person, Sue! I like what I can see of the shawl. 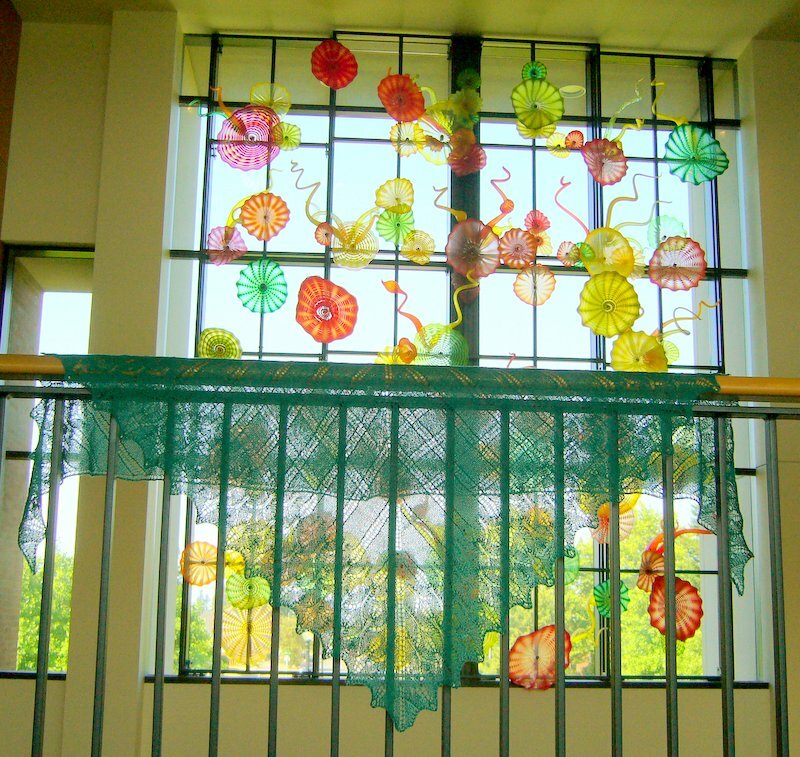 You should photograph it in front of a clear window, instead of in front of a Chihuly. Wow, your Icarus is amazing! I'm going to give mine a try, once I get started on a BD gift. I'm amazed at doilies, because I could never get the hang of them -yours is beautiful. And the tomatoes ... YUM!